Apple and Google have com peted with each other year after year. When Apple comes out with a new iPhone, Google comes out with another Droid phone. The competition has been great for the markets and nobody has complained. I believe that the competition brings many great debates between these two major corporations. 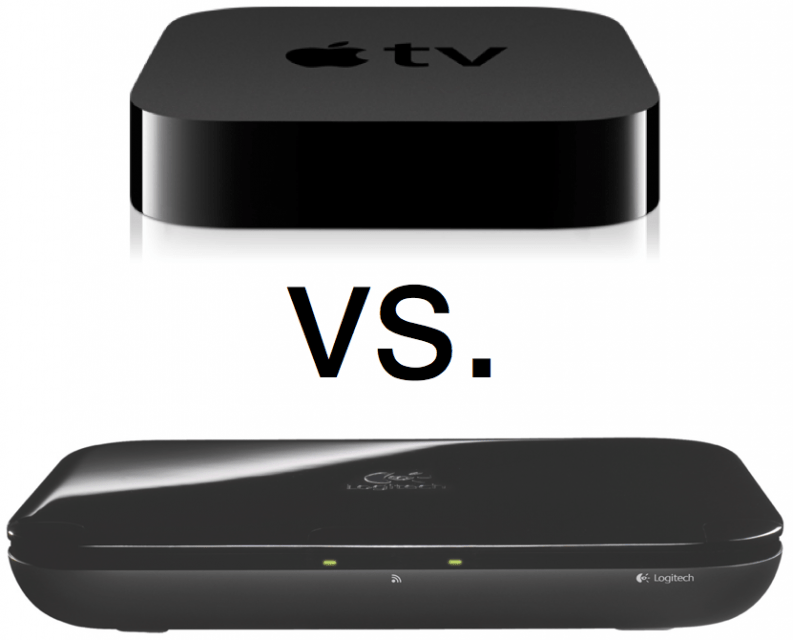 The newest debate is between Google TV and Apple TV. We all saw this in the near future, Google trying to compete with Apple TV and it has come out with a bang. Google features 4 GB of RAM and a 1.2 GHz Intel Atom Z515 that is featured in many netbooks. Google TV has dual HDMI and dual USB ports. Google certainly has a faster processor than Apple and is not afraid to show it. The TV box itself is bigger and not the most attractive thing next to your TV. It definitely is not home friendly and I would definitely try to hide it so it is not an eye sore. Google has brought in almost every internet source to push into this little box. It boasts Netflix, Amazon Video on Demand, YouTube, NBA Game Time, Blip.TV, VEVO, Pandora, and Napster. Google runs their Android O.S. to power their TV. It is a proven O.S. that is built in the Android phones. The problem with the Andorid O.S. is that it has no regulations. Many users will soon come across bugs and will start to notice that Google TV will run slower. Google will be releasing an sdk for developers to start making their own apps. Apple TV does not have this feature, but an App Store may be coming soon. Google does support flash, something that Apple cannot say and probably never will on their devices. Google lets you “Fling” which allows you to start a show on your phone, pause or stop it, and pick it back up again on your TV. Many of these features are very handy when it comes down to the wire, but Google may be trying to push this feature just so that it looks better on paper. Apple has certainly made a name for themselves in this department with the Apple TV. Apple TV has been around since the start of 2007. Apple has 256 MB of RAM and 1 GHz from the Apple A4 chip. The A4 chip is also in the iPad and iPhone and is extremely reliable and nobody can say that the A4 chip is not great. The A4 chip has impresses us all on the iPad. The iPad looks extremely and runs almost flawlessly. Apple TV has an HDMI port, optical audio, and micro-USB. Apple TV is a looker, it is definitely prettier then the Google TV, but that is what Apple does best. They make great innovative designs that attract many buyers to the product. It is definitely something that you want to be shown right next to your TV. Apple TV has iTunes, Netflix, YouTube, and Flickr. Apple definitely has less video and non-video content but, that is something that Apple is not afraid of. Apple has iTunes which is extremely proven to hold many videos and music videos. Apple does have set backs because of what Google TV has brought to the table. Google has had more time to make the Google TV but Apple will not take any excuses. Apple is a lot easier to control, considering the fact that everyone is familiar with Apple’s devices. Apple TV features AirPlay which allows users to stream content from their iPad or iPhone to their TV. You can also start watching a movie on your device, then continue from where you left off. Both of these products are extremely good. Apple hasn’t disappointed us again with their simple and easy interface that makes it very user friendly. Google has definitely surprised me with all of their features that makes Apple TV look slower and smaller. Google boasts more content and video and non-video content. Apple of course has their own remarkable operating system, but the android O.S. isn’t to bad itself. Many people will have trouble choosing between these two products because they are just that good. The competition has been brought forth from Google and they definitely have no disappointed. People that are die hard apple fans, or like the user friendly and sleek design. On the other hand, if you are willing to try something new, Google TV will certainly match every expectation you have for the device. Google has certainly not disappointed us and has made a strong statement that better things will come in the future for Google.